The sun’s ultra-violet rays takes a toll on your boat’s plastic, rubber and vinyl components, often leaving them dry, cracked and faded. While most UV protectants claim to provide durable protection, the fact of the matter is if they don’t contain Ciba Tinuvin UV Inhibitors – the most advanced and effective UV protectant – they aren’t doing much to prevent cracking and fading of vinyl surfaces. 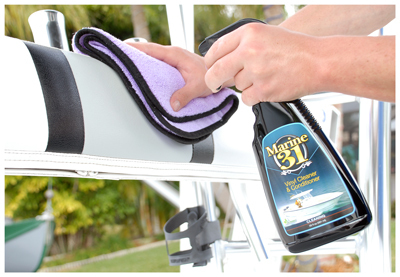 Marine 31 Vinyl Cleaner & Conditioner is formulated using the highest amount of Ciba Tinuvin UV Inhibitors available in a vinyl protectant. This size has been discontinued. Please see other sizes available below.